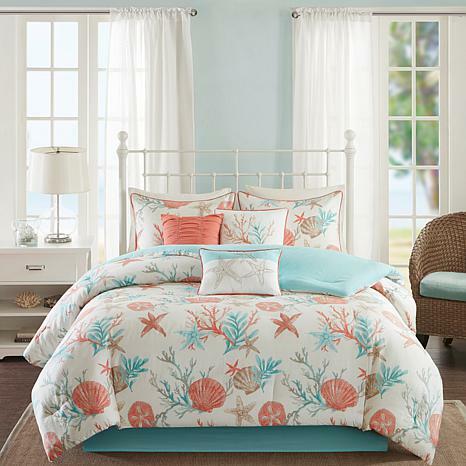 Bring the seaside home with this bright and playful comforter set. The rich coral and teal colors play into the starfish and coral motifs adding texture and color to your space. Feel free to toss the decorative pillows on the bed or into a chair to help carry the theme throughout your room. I absolutely love this set! I bought the bathroom set a few months back at bed bath and beyond and when I saw this on hsn I just fell in love! It is well worth every penny and so fluffy and comfortable!! This comforter set is so soft and plush, it feels like sleeping under a cloud! The blue is more of a light teal but I love the colors!